Medill File Photo - The world's most powerful atomic particle accelerator at CERN is searching for the fundamental building blocks of the universe. Forgers beware! Physicists at the University of Notre Dame have been accelerating ion beams to find out the makings and origin of art materials and archaeological finds. This technique could be used to find the fakes. Physicists said that this non-destructive technique could even be used in "art forensics," the detective field of determining fakes. Michael Wiescher, professor of nuclear physics at the university, said that technique can identify elements in the materials used to create paintings and archaeological finds. If you find materials used that were not available in the past - or compare it to pigments in an artists other works and find they are different - then you know you probably have a fake, he said. To apply the process, nuclear physicists accelerate subatomic particles such as protons to a specified energy level, he said. 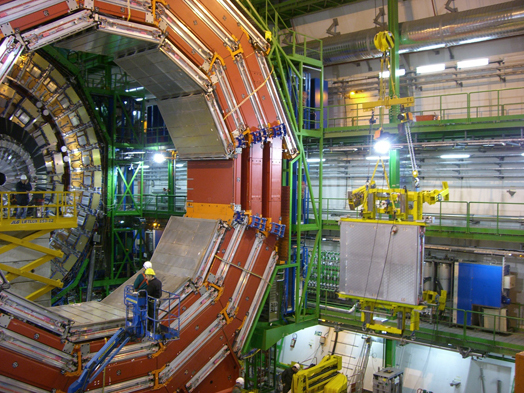 A beam of these particles, with the energy boosted in an accelerator, is focused on the spot to be analyzed. The energy of the protons can be changed for each application so that the atoms on the surface of the artifacts or those that are deeper can be excited, Wiescher said. The atoms give off X-ray radiation and the energy levels of that radiation offers a fingerprint of certain elements. “So you can figure out what’s in there,” he added. So far, Notre Dame researchers have not used this technique to find fakes, although there are places in Europe that do so, such as at a lab in the basement of the Louvre, Wiescher said. “We took well-defined materials to understand the historical contexts,” he said. He said that researchers are trying to establish this identification technique in the United States. It has been developed in Europe over the last 20 years. According to Mark Schurr, a professor of anthropology at the University of Notre Dame, the common problem in archaeology is to figure out what kind of materials you are looking at and where they came from. Copper used by the Native Americans, for example, was pure copper, but Europeans brought brass that looks like copper to the Americas, he said. Using this technique and identifying the difference helped researchers figure out whether the copper is Native American or European. “Using this technique you can identify the source areas of materials and that can be used to identify forgeries,” Schurr said. A common pigment that is used in forgeries is titanium dioxide, which is an industrial product, Schurr said. And if this pigment were found on a pre-historic pot there would be cause for suspicion, he said. “But what is great is that the technique is non-destructive,” he added. Depending on the scope of accuracy, such a technique can add to our knowledge of a given work of art and our understanding of its place in a period, said Robert Munman, associate professor emeritus of art history at the University of Illinois at Chicago. “However, the likely problem with using this technique is that that it is almost surely applicable only to ancient works of art but not to the narrower chronological precision needed for anything, even relatively, modern,” he said. For instance, painter Vincent Van Gogh worked on plywood for at least one painting and the material is still available, Munman said.